This week we’ve got a new member deal to celebrate the start of the football season. 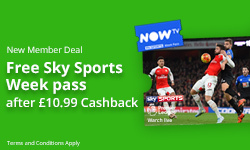 We're offering new members signing up to TopCashback a Free Sky Sports Week Pass with Now TV! All new members need to do to claim this deal is follow the steps below! All new members have to do to claim their FREE Sky Sports Week Pass is follow these four easy steps! New members click on the banner above and sign up to TopCashback; ww will take them to the offer page. New members click 'Get Cashback Now' to go through to Now TV website and purchase their Sky Sports Week Pass as they normally would. Members can enjoy watching their favourite sports knowing they'll be recieving £10.99 cashback.